About six weeks ago I found myself in Lafayette Gourmet, and came across what I thought were albino caviar. 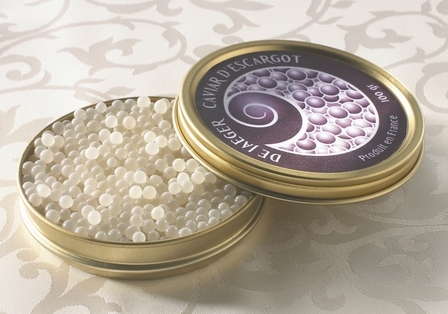 It turned out to be snail caviar, or in laymen's terms the eggs of snails. The promoter was offering samples and I had a go. They looked so beautiful, glistening like pearls. The membrane pops with a satisfyingly fresh snap when bitten into, revealing tiny shots of liquid that tasted terribly subtle, with hints of sweet,briney, savoury, herbal and woody notes, all very transient. How intriguing. It is not ever going to replace sturgeon's eggs but can hold its own among its other gourmet brethrens. I noted their email and asked for an image of their product, which they sent to me along with some notes. The company farms the snails in the snail equivalent of Ritz conditions, feeding them vegetable and cereal matter. EAch snail lays about 100 eggs a year, equivalent to 4 g, so for this 100g tub they'll need at least 25 snails. The eggs are then cured in that mythical French salt la fleur de sel de Guérande before finally ending up in their elegant packaging. The company is looking for distributors outside France, for more information please visit their website. No, they did not give me any bribes to say all these, it was simply that this product was such a novelty for me.